For the past 20 years, I have been following my dream of creating sacred art for the purpose of inspiring myself and others to awaken to who we were meant to be, to who we’ve always been. In my family of origin, I was viewed as the unartistic one. I was was often told I should be a counselor or teacher, but artist, definitely not! 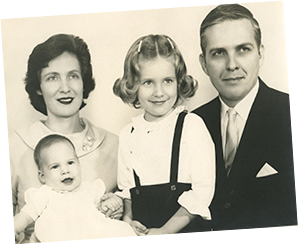 My parents were talented hobby artists — they loved to draw, paint, sculpt, and write. But not me. From K-12, when I attempted anything creative, my father would “help” by revising what I had done to the point where it was unrecognizable as mine, even by me. Of course it would receive an ‘A’, but I never felt like I deserved it, or more importantly, that I had any creative talent. My true calling found me when I stopped looking for it, and started noticing what gave me joy. This unexpected path started in the middle of a rewarding-but-very-stressful job as a university career services director, where I was guiding others to find their true callings. During this time, I found myself deeply questioning my own career choice, and began putting myself through of the exercises I used with my students. My favorite exercise, and the one that changed my life’s course, was the one where you list all of the things I loved to do as a child without being told to do them. 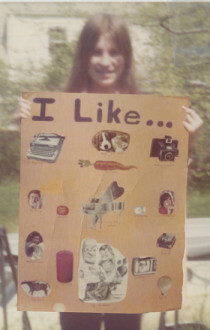 Smack in the middle of my list was the word collage, sparking the memory of the 10-year-old me proudly holding my first collage – yup, this is this rudimentary collage (pictured to the right) that sparked the journey to find my true calling. So, on a whim (otherwise known as a flash of inspiration), I gathered up all of the magazines and catalogs I could find, tore out a bunch of images, and put the pieces back together into a simple, child-like collage. As I looked down at what I’d created, I realized: I was having FUN. My heart exploded with joy. My mind focused on this task and only this. I didn’t want to stop rearranging the pieces, ever. I was completely captivated. 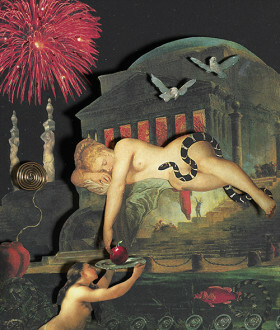 That first collage in 1993 led to creating collages nearly every day for the next three years. I framed many of my “beautiful” creations, and decorated my office at the college with them. Colleagues and students made comments like, “Oh, you have children.” I didn’t, but that didn’t bother me. These reflections of my soul were children to me. I loved every one of them. 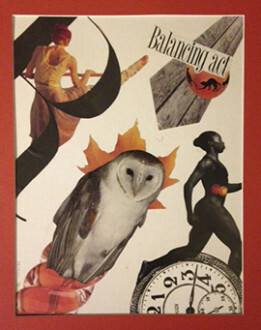 Creating collages as a hobby was an amazing source of stress relief, but unfortunately it didn’t change the way I felt about my job – I still didn’t like it. I had heard that saying many times before, but suddenly it had new meaning. I realized that I had been resisting my college job, and thus it was persisting. So I decided to change this pattern by silently saying “this moment is my destiny” EVERY time I found myself resisting where I was. For instance, when an employee was complaining to me, and I would feel my shoulders tighten and my “lizard brain” saying that I didn’t want to be there, I stopped my myself mid-thought and silently said “this moment is my destiny”. Then I relaxed deeply into being with my complaining employee, thinking to myself that I’m meant to be sitting here, because that is where I am. THIS moment is my destiny because I’ve lived my entire life to get to THIS precious moment, complaining employee and all! For three months, this scenario played out over and over again, until one day I realized that I had fallen in love with my job, AND never wanted to leave. Wow! And that is when the miracle happened. Out of the blue, a stranger called and offered me a new job (working for the publisher of the MBTI personality assessment), something that I had secretly wished for many years ago. If you want to hear more about my journey to create this dream job, hop over here. The bottom line is this – I stopped my resistance to a job I hated, and as a result I attracted a job that was better than my wildest dreams. The only tangible thing I did to create this miracle was to fully surrender to where I was by saying over and over again “THIS moment is my destiny”. So I left my beloved college job, in spite of being in love with it, and went to work for the publisher of the MBTI for the next four years. and as a result, my art skills dramatically improved, and my confidence as an artist grew with it. Soon after, I photocopied one of my new collages (Original Blessing pictured to the left) and sent it to a friend in California. She framed it and hung it on her office wall. 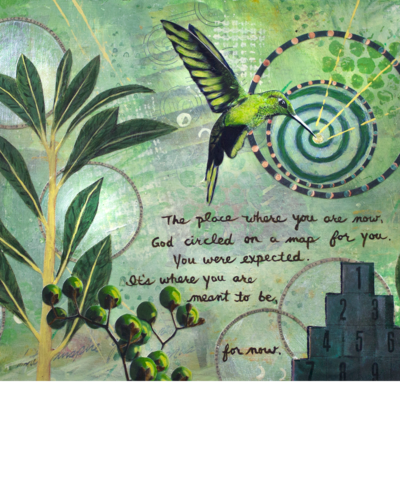 One of her wealthy clients saw it and called to buy a print of this piece. In that sweet instant, everything changed. As quickly as I could, I researched and purchased an archival inkjet printer. I taught myself how to professionally mat a fine art print, and sold a print of Original Blessing to this blessed first customer. This small sale awakened a spark within me — I could suddenly (realistically!) imagine earning my entire living from art and set about making that happen. It took four years, but in 2001, I quit my amazing day job (working for the MBTI publisher) and took a major leap of faith to become a full-time artist. During the next four years, I learned how to be a self-sustaining artist, and had the time of my life creating and selling art. I loved Monday mornings because I got to return to creating art. (I took weekends off to focus on other parts of my life, like my husband and friends. Work-life balance, as they say.) Each weekday morning, I would spend 5 hours creating new collages, and each afternoon I focused on the business of selling art. By 2004, I was winning awards at competitive fine art festivals, having solo gallery shows, and selling to both retail and wholesale accounts. I was easily paying the bills and was nearly where I wanted to be as a professional artist. Then my journey took another unexpected turn. 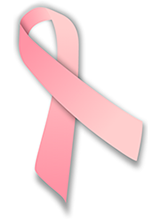 On October 4th, 2004, I was diagnosed with breast cancer. I was completely blindsided. I had always taken good care of myself, both physically and spiritually, and had no family history, but this cancer did not discriminate. At only 44 years old, and otherwise healthy, I now faced the very real possibility of losing my breasts, and possibly my life. Thankfully the worst did not happen, and I actually received just the opposite of what I expected. I remember waking up after cancer surgery saying over and over again that it was my birthday, the day I got to start again, and we had an impromptu “birthday party” in my hospital room to celebrate my new life. Hard for most to believe, but this was one of the most joyful days of my life. This twist in my journey taught me to fully live in non-resistance to what was before me. Rather than fearing death, I focused on what was true in each moment. I learned to say YES to all that showed up, and all that showed up was a total blessing (even when it sometimes didn’t look so good on the surface). My journey through breast cancer led me back to my day gig with the MBTI publisher (a job I still dearly love). 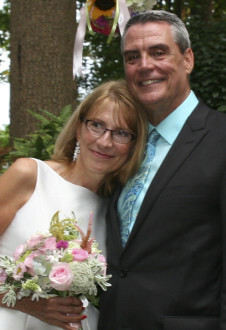 It also brought about the end of a 24-year marriage to my high school sweetheart (who I now jokingly refer to as the “starter husband”), and eventually into a heart-filled, peaceful new marriage with the love of my life, Robert. My intention was to stick with the day job for ONLY one year, and return to full time art as soon as possible. But one year turned into two, and in a flash it was ten. Sadly, I had created very little art in all that time. Finally on January 5th, 2015, I decided to stop making my day gig an excuse for not creating art, and made a plan. Despite intensive travel teaching the MBTI (sometimes 3 or 4 weeks every month), I reorganized my life to focus on what was most important. I started bringing my art studio with me on the road by packing two – 50 pound suitcases, one full of art supplies, and doing art from hotel rooms at night. I remained focused on creating art almost daily, fitting it into the nooks and crannies of my life. One small step at a time, I found my way back to what I most loved (read more about this here, here and here), and all while working full time. I created lots of art on the road, and the more I created, the more time I wanted to create. Yet I also didn’t want to leave my wonderful day job. How could I continue to do both, AND have a sane, balanced life? Then on September 1, 2017, the solution flashed into my brain. Would it be possible to work my day gig 5 days a month as a contractor, and create and sell art the rest of the time? Thinking this was a long shot, I presented the proposal to my boss, and to my joyful surprise, she LOVED the idea! So on January 1, 2018, I once again returned to creating art (almost) full-time, and traveling 5 days a month for my day gig. I finally have the best of both worlds, and my ultimate dream come true. I hope you will take the next step on my journey with me. Perhaps along the way, you will be inspired to follow that quiet (or shouting) voice inside of you — the one that is calling you to take the next positive step in your soul’s journey. The universe is rigged in my favor, always. Even when it looks “bad”, the universe is pointing me toward my next highest good step. What I resist – persists. As soon as I accept EVERYTHING exactly as it is, what I have been resisting, maybe even for years, lets go, like magic. Sometimes I lose site of this truth, and how well it worked in the past. As soon as I remember again, life magically unfolds, with ease and peace. Living in complete non-resistance is my spiritual path. I say yes to ALL that shows up, no matter what it is. A friend makes a negative comment about someone I love – I internally say YES, and let go of the next thoughts that come into my brain. A politician stands for things I don’t agree with – I shout YES, and let go. No resistance, nada. My boss announces a policy I don’t agree with, that affects my job – a big whooping YES. Again, no matter what it looks like, everything happening around me, is for my benefit and is rigged in my favor. No exceptions. Be happy. No matter what drama is swirling around me, I choose blessed happiness. Quite the challenge sometimes, but this is my daily intention. Smiling for no reason is fun and good for my soul. It lifts my spirit, and the spirit of those around me. Its especially fun to smile in public for no reason and have your smile infect those around you, even strangers. Thoughts have power, so I let go of the negative ones as soon as I recognize them creeping into my consciousness. So-called “failure” is the Universe pointing me in a new direction, one that better reflects my highest good and that of all concerned. Life is not happening to me, its happening FOR me. EVERY moment is my destiny, and the next one, and the one after that. What few people know about me – but now YOU do! I LOVE my very part-time day gig teaching the MBTI assessment. This is not a secret to those in my workshops. Other than collage, I can’t imagine anything more fulfilling. My MBTI preferences are for ENFP, although I often flex to ENTJ for my day gig. 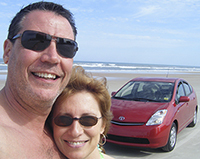 My red Prius is called Sippy (she sips gas). This is “her” first family pic! After months of searching, we finally named our new Bosch dishwasher Barbara. Barbara Bosch – get it?!? This was my sweet husband’s idea – I’m still getting used to this unusual choice, but I guess all the names are odd, so it works! I have no biological children, although have always considered my nieces grandchildren. I simply cherish every one of them. I have walked on fire, and didn’t get burned, although I don’t plan on doing this crazy act again any time soon☺! 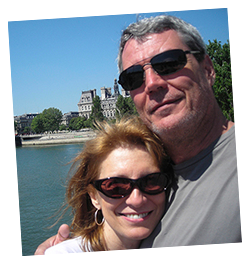 Robert, the love of my life, took me to Paris on my 50th birthday – that act alone made him a keeper. I drink Dr. Axes green powder, juice from one lemon, and a teaspoon of Menuka or organic honey and water every morning before I meditate and begin creating art. I am very attached to my Fitbit and am in daily competition with my darling Robert and sister for the most miles. I have more sweaters and shirts that most people I know – I simply love variety to choose from each day. I donate at least 1/3 of my wardrobe each year to charity to make room in my closet for new treasures, which are usually extreme sale items from The Loft, Banana Republic and Lucky. I did 7 internships in college, trying to decide what to be when I grow up. True to my MBTI type, I’m always open to new possibilities for earning a living, but have narrowed the choices to MBTI trainer and artist (thank goodness). I was married for 24 years to my high school sweetheart, aka “starter husband”. I learned a ton from my first go-round, enough to make the second one last and thrive. Speaking of my enchanting second marriage, I met my darling Robert in 2008 on a blind date. He prefers ESTP, and I cannot imagine a sweeter, kinder, more generous, loving partner than this dear soul. 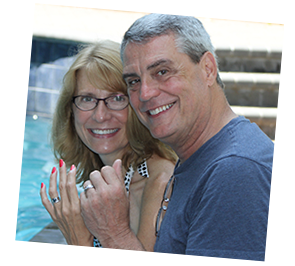 We got married in a romantic backyard wedding surrounded by our family and friends on July 18, 2015. I grew up in a crazy household, with a mentally ill mother, a loving co-dependent dad, and younger sister who I defended and mothered when no one else was there to do it. 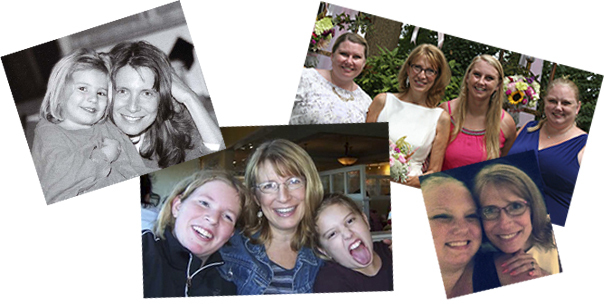 If I had been given the choice of mothers, I wouldn’t have consciously chosen mine, however she was absolutely the one I needed to become the person I am today – strong, brave, resilient, giving, loving and kind – all descriptors I strive to live up to every day, and how I like to imagine she was really like behind her illness. Being mentally healthy is one of my strongest values, and I’ll give up food before I would give up a counseling session or long chat with a trusted friend.